For those of you who don’t have time to come down to visit us in Orchard Road – Goldilocks now has its own showcase at the hansel store in Stamford House by the defunct Capitol Theatre. We went there to set up lights and display some new stock. While in the shop, we could not help but notice the new cross stitch inspired decor and the lovely new pieces from the newest collection called ‘Lily the Lady’. For anyone who has been watching the TV series Mad Men – be inspired! 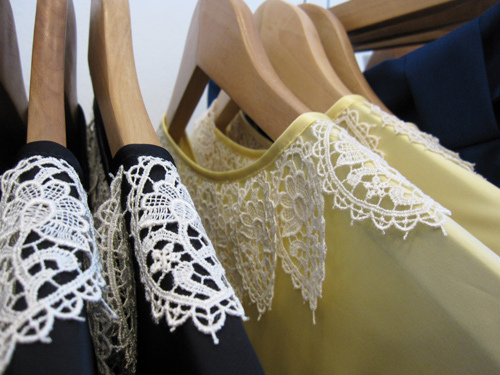 Sara could not take her eyes off this lovely Lace Collar Dress! Here in a very sweet colour combo a la Swedish flag… She left the shop a proud owner of one in Navy Blue…. We also spotted the Sequin Bustier Dress (on Sale!) that the lovely Katy Perry wore when she crashed a high school prom in Australia recently. See more here.